A dramatic decrease in new orders, mostly for export, for the non-manufacturing sector of the economy offset other positives in the December ISM report. The composite non-manufacturing index dropped slightly but is still growing. 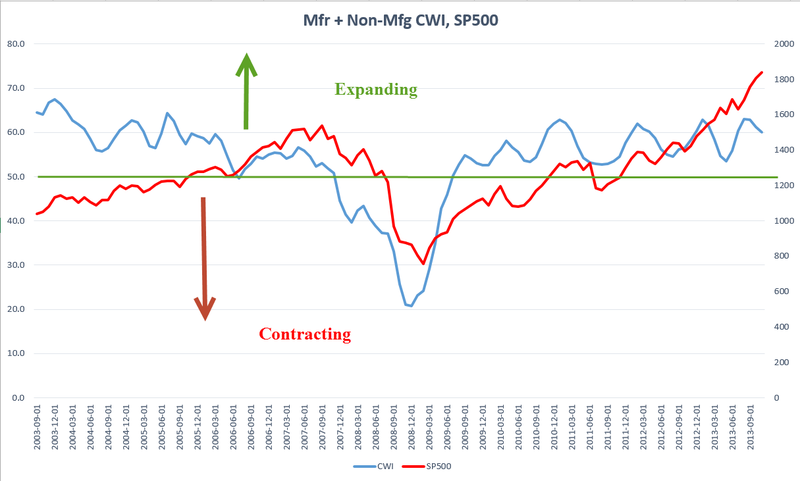 A blend of the manufacturing and non-manufacturing indexes, what I call the CWI, declined from its peak as expected. A month ago I noted the cyclic pattern in this index, and the shorter time between peaks as the economy has formed a stronger base of growth. Most businesses are reporting expansion, or strong growth. Some respondents to the survey noted that the severe winter weather in December had an impact on their business. Ringing in the New Year, the private payroll firm ADP issued a strong report of employment growth before the release of the BLS figures on Friday. The reported gain in jobs was above the best of expectations. In the past few months, several reports in production and now in employment have exceeded expectations or come in at the upper bounds of estimates. Wells Fargo announced that they will be offering non-conforming mortgages to selected buyers who present a low risk. Non-conforming mortgages may be interest only, or have loan to values that don’t meet guidelines. Reminiscent of the “old days,” Wells Fargo intends to hold onto the mortgages instead of selling the paper in the secondary market. The Gallup organization announced their monthy percentage of adults who are working full time, what Gallup calls the P2P. I call this the “Carry the Load” folks, those people whose taxes are supporting the rest of the population. At 42.9%, it is down a percentage point or two from previous winters. 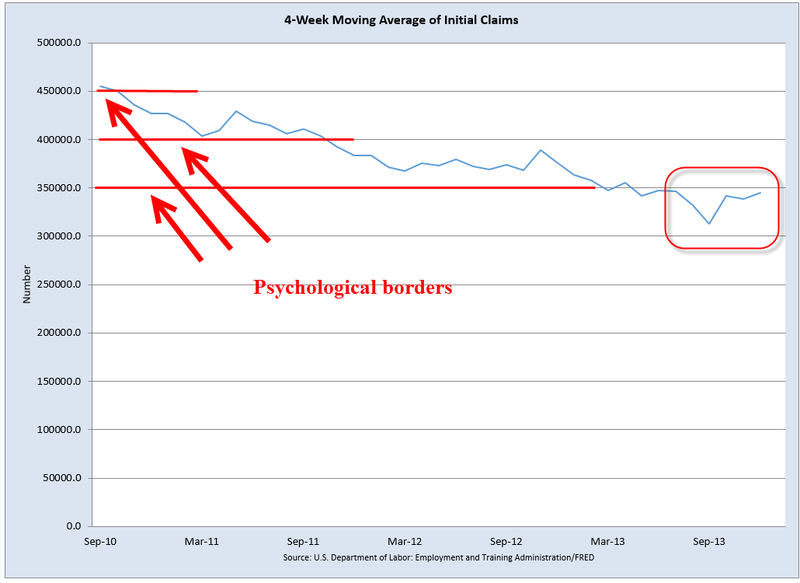 The 4 week average of new unemployment claims is still below 350,000 but 20,000 higher than a month ago. As I mentioned last week, this metric will be watched closely by traders in the coming weeks. Although there is little statistical significance between a 349,000 average and a 355,000 average, for example, there is a psychological boundary marked in 50,000 increments. Friday I woke up and found that somebody stole the ‘1’s at the Bureau of Labor Statistics. The BLS reported net job gains were 74,000 and I thought that there was a smudge on my computer screen blocking the ‘1’ of 174,000 and reached out to wipe it off. There was no smudge. 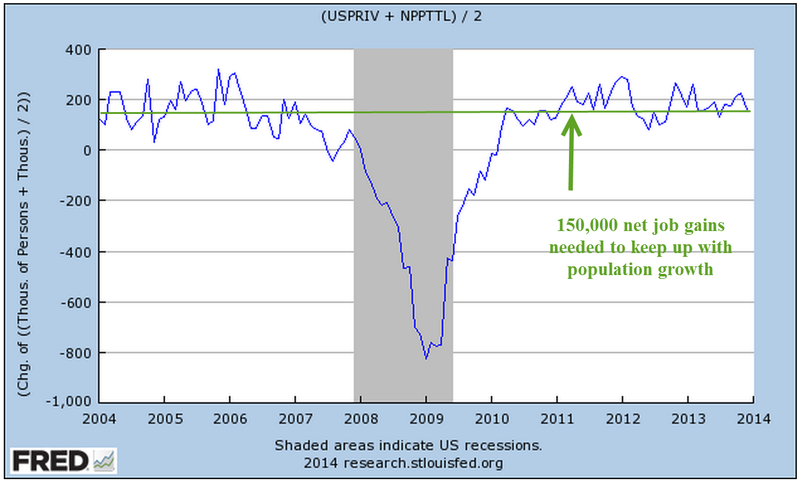 It is difficult to interpret the discrepancy between the ADP report and the BLS report. Some say that the particularly harsh winter weather in the midwest and east caused many people to stop looking for work or that many businesses returned their BLS survey late. If so, we may see some healthy upward revisions to the employment data when the February report comes out. 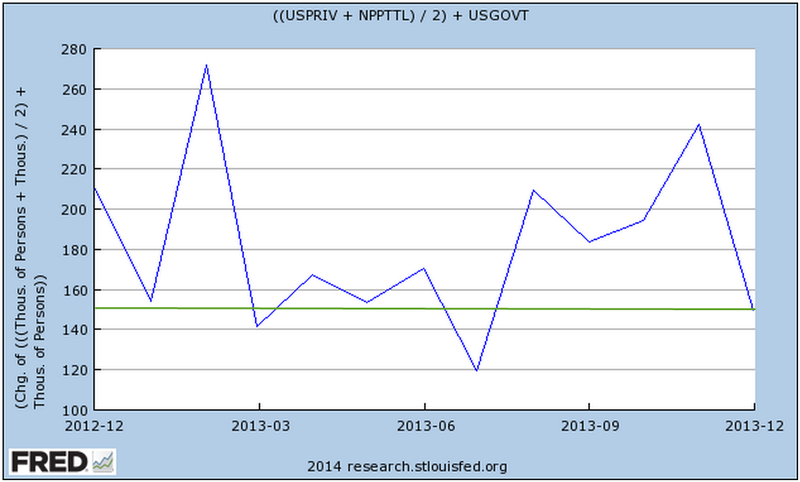 Here’s a look at total private employment as reported by BLS and ADP. As you can see there is a growing divergence between the two series. 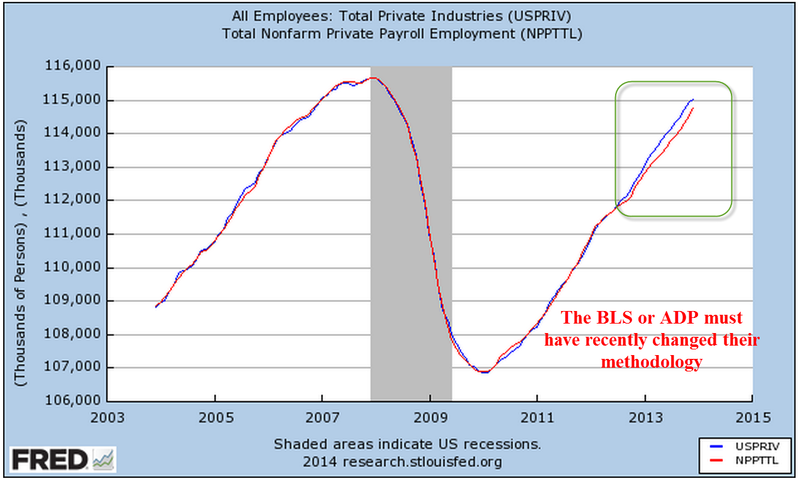 As a percentage of 120 million or so employed in private industry, the divergence of a few hundred thousand is slight. The BLS assumes a statistical error estimate of 100,000. But people closely watch the monthly change in employment as a forecast of developing trends in the overall economy, changes in corporate profits and consequently the price of stocks. 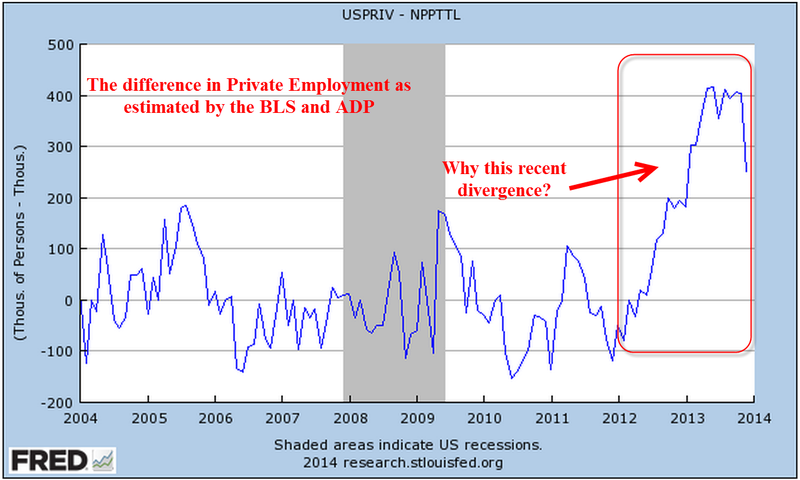 Here is a chart of the difference in private employment as measured by the BLS and that measured by ADP. A positive number means that the BLS is reporting more employment than ADP. As with any estimates, I tend to average the estimates to get what I feel is a more accurate estimate. This averaging works well when bidding construction jobs and some statistical experiments have proven the method reliable. Averaging the two estimates for private payrolls gives us an estimate of job growth that is still above the replacement threshold of about 150,000 net job gains per month needed to keep up with population growth. The figures above do not include 22 million government employees, or about 14% of total employment. Flat or declining employment in this sector has dragged down the headline job gains each month. Adding in net job gains or losses in the government sector gives us a net job gain of about 150,000 in December. For those of you interested in more analysis of the employment report, Robert Oak at the Economic Populist presents a number of employment charts similar to the ones I have been doing in past months. For the past 5 – 10 years, much has been written about the growth in income inequality during the past 30 to 40 years. I’ll call income inequality “Aye-Aye” because the abbreviation “II” looks like the Roman numeral for “2” and because Ricky Ricardo used to exclaim “Aye, Aye, Lucy!” on that much loved comedy series. Those on the left blame former President Reagan, British Prime Minister Thatcher, and deregulation for Aye-Aye. Those on the right blame increasing regulation that disincentivises businesses from taking chances, from making capital and people investments to pursue robust growth. The expansion of social welfare programs makes people ever more dependent on government and less likely to take jobs that they don’t want. Economists cite the aging of the population as a cause of the growth of Aye-Aye. Few I know of seriously challenge the idea that Aye-Aye has been happening. The argument is over the causes and the solutions. Thomas Piketty’s Capital in the 21st Century will add to the debate. The English translation will be published in March. A book review in the Economist outlines some of the ideas in the book. Piketty’s analysis of almost 150 years of data from several countries indicates that the slower an economy grows, the more unequal the distribution of income. One might think that the U.S. would have the most unequal income distribution, but Piketty reveals that it is France that tops the list. Piketty’s rule of thumb is that the savings rate divided by a country’s growth rate will approximate the ratio of capital wealth to gross income. As this ratio increases, more of the national income goes to those with capital wealth. So, if the savings rate is 8% and the growth rate is 2%, then capital wealth will be about four times gross national income. Furthermore, he finds that population growth accounts for about half of economic growth over the past century and half. Slowing population growth in the developed nations therefore leads to greater inequality of income. If this rule of thumb is fairly accurate, stronger economic growth is the only way to lessen the inequality of income that has grown steadily over the past thirty to forty years.